Just as the NES led us to the Super Nintendo, and the Sega Master System made the Mega Drive possible, Stockade’s 8bit IPA has laid the foundation for its levelled up version, 16bit IIPA. 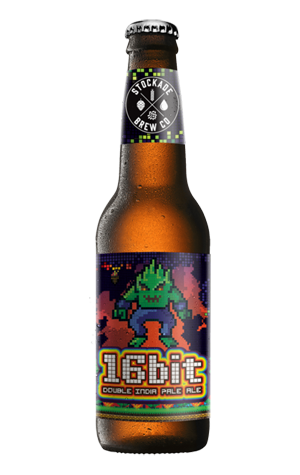 Keen observers may have noticed that Stockade had to remove the cartoon character from the 8bit label, but the transient 16bit is able to sport a pixelated hop hulk and be gone before it can cause any trouble. But not before leaving a mark on our impressionable taste buds. With its rich orange colour, it may look like Fanta for grown-ups, but this drink isn’t soft. The 9 percent ABV, syrupy body and hint of alcohol warmth all tell you this is a big beer. However, it's hard to remember that: with sweet stonefruit up front and smooth, piney resin following hot on its heels, this one’s surprisingly easy to drink. It also leaves one question lingering: will we one day see a 32bit from Stockade?